Mixing toddlers and touchscreens can be a tricky – not to mention sticky – situation for today’s parents. Adults often find themselves glued to their smart phones and tablet – and aren’t sure what to do when it comes to sharing those devices with their children. Should they follow the (somewhat surprising) example of Apple founder Steve Jobs, and ban them completely? Or is it better to go the way of Facebook’s Mark Zuckerberg, who seems keen on sharing the magic of social media with his young family? To help us understand the concerns and possible benefits of touchscreens, we need to consider both the context and content of their use. Touchscreens are multifunctional and their uses are often multiple. Many of these do not have a strictly educational purpose, but they can enhance children’s self-regulation skills (as well as parenting strategies). Some parents use touchscreens to extend their children’s play at home. Some use them as a portable television – and some to teach their children letters and to develop a love for reading. 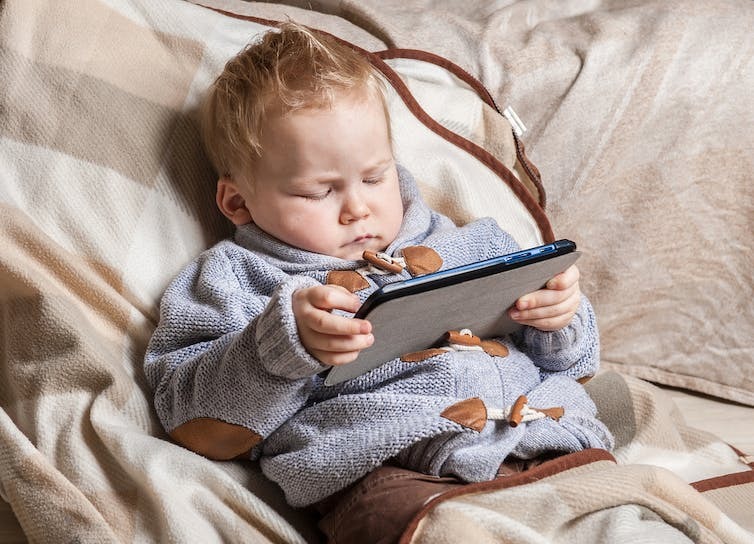 Tablets are also used for calming or distracting toddlers during travel or medical procedures. Ultimately, it is up to each individual parent to decide what is important for their child, them and their family. That said, it can be helpful to ensure that touchscreens are used for a variety of activities. Merely using them to play repetitive games is an under-use of their potential to support so many more activities. These include apps which can be used for a variety of activities such as creating simple books or drawing and colouring. At last, some time to myself just to read…. To help support children’s reading for pleasure for example, there are many good quality apps available, some of which are reviewed on sites such as Literacy Apps and Children’s Technology Review. On Common Sense Media Review parents can browse reviews of apps by skill type, subject, device, price and rating scores. Age-related recommendations for length or frequency of use vary by country. This reflects different attitudes towards state responsibility for family policy, but also cultural expectations about childhood. The American Academy of Pediatrics interprets what it perceives as a lack of conclusively positive research as a reason to take a precautionary approach. It currently suggests that children younger than 18 months should be discouraged from screen media, other than for video-chatting. Across other countries there is a growing consensus that we need an international approach towards technology use with young children. One European research network group is dedicated to this mission – and some progress has been made, with guidance for parents to be launched later in 2017. In the meantime, its website has publications on issues such as children’s engagement with virtual reality, and the “internet of toys”. In the UK, parents of the youngest children (under two year olds) are most worried about the health implications of digital media. Yet there is evidence that many infants are already using touchscreen technologies. For children of all ages, but especially younger ones, supervised use is recommended – for example, adults and children sometimes playing games and engaging in other activities together. 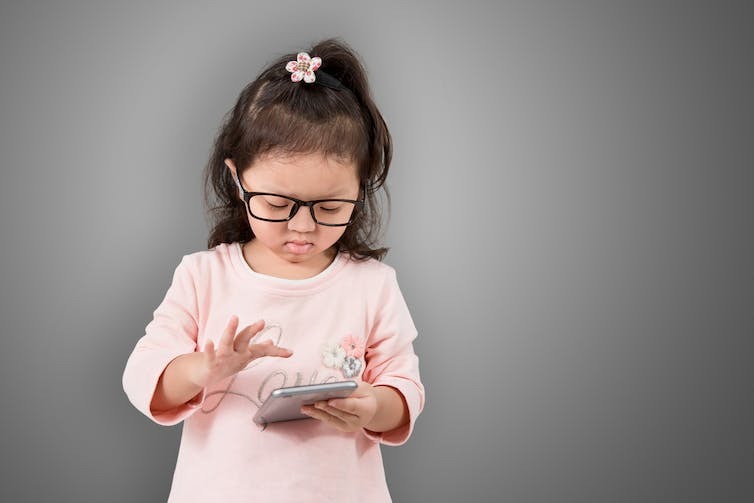 A number of apps, such as CBeebies or Toca Boca, focus on the development of appropriate skills, such as hand-eye co-ordination, and draw on well established games for toddlers such as hide-and-seek and peek-a-boo. Research on technology use is still new and requires agreement on what we measure and how. This is compounded by the problem that we would need repeated and longitudinal studies to have guidance that is only about touchscreens and applies to all children. But some research has already begun to unearth evidence about touchscreens and particular learning skills. For example a study found that use of touchscreens can accelerate children’s fine motor control, hand-eye coordination and visual attention. Another has shown that toddlers can learn new animal names from tablet e-books. 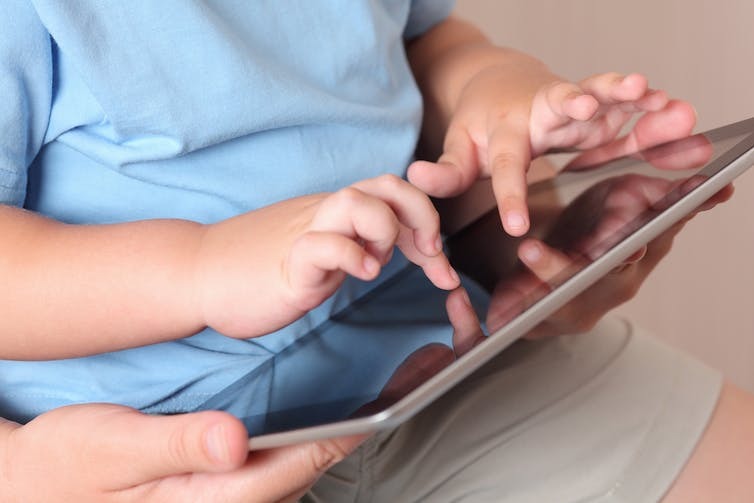 Yet other studies found that toddlers can retain knowledge and transfer to the real world what they learn on touchscreens only if the interaction is supported by adults. Organisations such as the UK’s National Literacy Trust and the Joan Ganz Cooney Center in the US therefore focus on encouraging positive shared use of technology in families, whether it is for joint reading of e-books or playing games together. The use of touchscreens in families is changing rapidly, as is the functional capacity of touchscreens and quality of their programmes. We are yet to build a comprehensive road map of risks and opportunities. But despite the excitement and novelty of these technologies, one thing is certain. We must not forget the enduring needs of parents and children to communicate with each other – and share in the joys of everyday objects which don’t come with a screen.